I’ve been following the fashion shows for, erm, 30-some years — ever since watching Elsa Klensch on CNN Saturday mornings while other kids were watching cartoons — and I can’t ever recall a season where the humble crewneck pullover factored so prominently into collection after collection after collection. 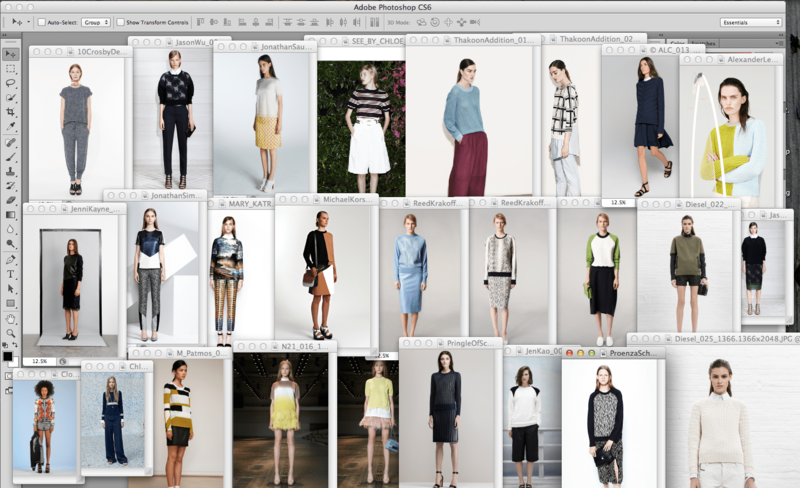 In Resort 2014, it shows up reinterpreted more ways than I can count. In knits, leathers, wovens and combinations thereof; solids, patterns and appliques; eyelets and laser-cut “lace.” The list goes on. So much inspiration around simple shapes beautifully rendered. I spent most of Sunday trying to wrangle an epic post detailing a vast array of them, but it was totally unmanageable. In the end, I had to whittle it down to this relatively small pile of images (click to enlarge). You’ll have to follow the links to see all these tops in their full glory. I hope you find something inspiring in it! That’ll be our ICYMI this week: Best of the best of Resort 2014? This entry was posted in Finds and tagged fashion, fasion week, knitting, resort 2014, sewing, sweaters. Bookmark the permalink. Oh, my god. These sweaters. And Elsa Klensch! I used to imitate her distinctive speech pattern. LOVED watching her!